Dulaney Software Group released and developed the most requested videoat game online for a long time but nobody answered the calling to make it so we did. This game is jam packed with realistic landscapes and a couple different scenes that actually took place in 1831. 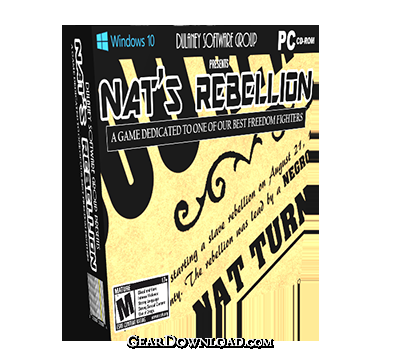 This game is based on the Nat Turners slave rebellion. In the game you must search every slave out house for health and weapons because you will need it at the end to fight the militia.Without the weapons and health it's almost impossible to win. This download (NatsRebellion.exe) was tested thoroughly and was found 100% clean. Click "Report Spyware" link on the top if you found this software contains any form of malware, including but not limited to: spyware, viruses, trojans and backdoors. Sea Wolves 1.03 - You are the captain of a frigate and you are furrowing the boundless seas. Cognizance 1.0 - A 2D horizontal shooter that combines traditional shooter and RPG elements. Aveyond I: Rhen's Quest 2.3 - More than 60 spellbinding adventures and fun! MorphVOX Classic Voice Changer 2.0.6 - Pure Voice Changing Fun - Change the way you play games and chat online. Gorakion RPG 2.33 - Create your own mage, learn the most powerful spells and fight evil monsters! DOFUS 2.6 - DOFUS is an astonishing Massive Multiplayer Online Role Playing Game.